If your kids are anything like mine, they never tire of the baking soda and vinegar experiment. Any science for kids that produces an eruption is at the top of the list of favorites around here. 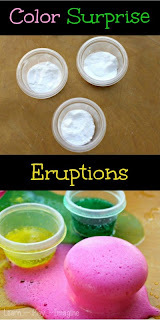 We've been on a rainbow kick lately with rainbow slime, rainbow paintings with marshmallows, and rainbow flour paint, and next up on the list is rainbow eruptions! We did use baking soda and vinegar, but we also made vinegar free rainbow eruptions. Directions: I put one packet of Kool Aid in each container then covered with a heaping spoonful of baking soda. I added yellow food coloring to the yellow Kool Aid since it never turns out very bright. I used yellow and blue Kool Aid to make the green, and I also added a couple drops of green food coloring. I added a couple drops of blue food coloring to purple Kool Aid for indigo and used only the Kool Aid for violet. I gave the boys each a squeezy bottle full of water and instructed them to start squirting on my cue. *Please note* Vinegar is not needed to make eruptions with Kool Aid and baking soda since Kool Aid contains citric acid. I was every bit as dazzled by the results as my kids! 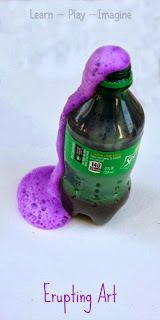 The Kool Aid and baking soda fizzed all over again each time one of them squirted more water into the containers. Once the fizzing died down they poured all the colors into each other resulting in a muddy brown. After all the water was gone and the colors were mixed the boys refilled their squeeze bottles again and again to extend the activity. 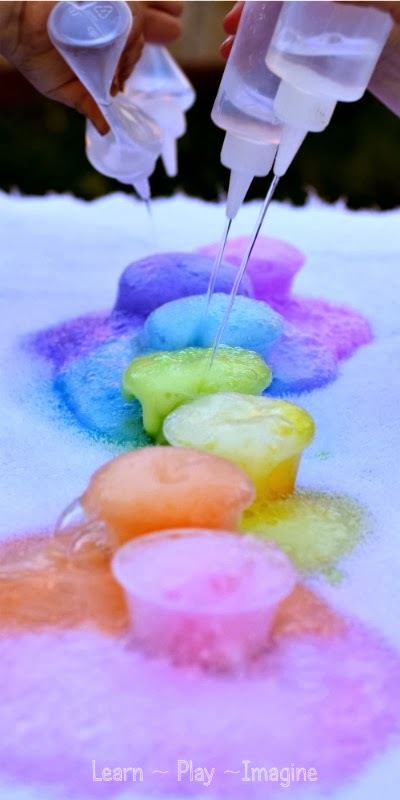 We had so much fun making rainbow eruptions that the boys requested to do it again the next day. This time we used baking soda and vinegar. I squirted a small amount of liquid watercolor paint into the containers then covered it with baking soda, concealing the color. This time I filled the squeezy bottles with vinegar. For more rainbow recipes for play follow me on Pinterest. This looks like so much fun! I've never seen Kool Aid in Australia and we don't have any liquid watercolours, so we'll try it with food colouring. Thanks for posting. This activity is a great combination of science, colour and FUN!! This is seriously seriously awesome! I can't wait to try it!!! This activity looks like SO much fun for kids! 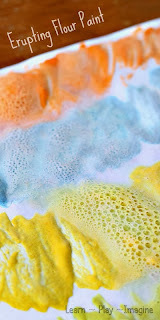 Feel free to visit my blog to link it up on our Artsy Play Wednesday Linky! This is just so cool and awesome. My boys are going to love it! Thanks for sharing! This is wonderful! What size squeeze bottles do you recommend using with little kids? 6 oz? 8 oz? Does it have to be Kool aid or can you use generic drink flavoring? The citric acid in Kool Aid is what reacts with the baking soda, so as long as the generic drink has citric acid it will work. If you use washable coloring it shouldn't. We have never had an issue with staining. I would test a small spot if staining is a concern. Oh my gosh this is fantastic! My niece will love it! Looks so much fun. My kids will love it. Thank for sharing.